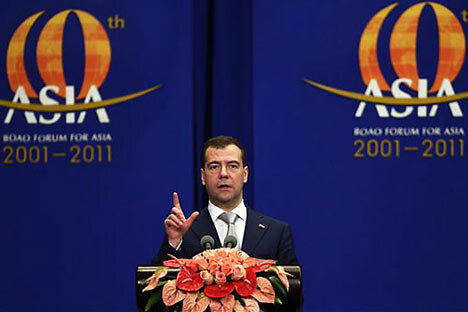 Medvedev proposes modernization theme for Vladivostok APEC summit. Russian President Dmitry Medvedev took part in the Boao Forum for Asia. He addressed the forum with a speech on opportunities for economic cooperation between Russia and the Asia-Pacific region countries. During this speech Dmitry Medvedev has proposed to devote the APEC summit in Vladivostok in 2012 to the theme of cooperation for modernization. He said about it in his speech at the opening of the Boao Asian Forum. "We suppose to bring to the forefront of its activities the theme of cooperation with modernization aims," he said. "The APEC, which is the most authoritative and representative regional structure, can play its role to create favourable conditions for the development of comfortable cities, free movement of goods, capitals, labour and services, to share the best advanced expertise and technologies, to stimulate the growth of innovations, and thus in practice to realize the principle of inclusiveness," Medvedev said, explaining the proposal to hold the APEC forum in the Far East under the theme "Cooperation for Modernization". President Hu Jintao, heads of state and government, Chairman of the Boao Forum Board of Directors Mr Fukuda, ladies and gentlemen, I want to start by thanking the forum’s organisers for this chance to exchange views on the biggest global development issues today, and discuss our common plans, including our plans for the Asia-Pacific region. First, successful inclusive development is possible only when we have democratic and fair international relations, not just political relations, but economic ties too. One of the biggest steps towards creating these relations is reforming the global financial system, which we have been working on over the last two years. Progress in this direction was achieved through unprecedented and very active efforts by a number of countries, by the G20 countries, with some help from other countries too. The BRICS summit that just took place in Sanya on Hainan showed that this group’s members support the formation of a new multipolar system of international relations that reflects the increasing spread of global development potential and the emergence of new, fast-growing centres of economic and political influence. Like other countries, we also face many problems and challenges, and we are working steadily and consistently to solve them. We are open for the broadest possible partnership in our modernisation efforts, and we will make this a key theme during Russia’s chairmanship of the APEC forum next year. APEC is the most influential and representative regional body today, and as such can play a part in creating good conditions for developing modern, comfortable cities, promoting free movement of goods, capital, services, and labour, exchanging the latest experience and technology, and encouraging innovation development, thus putting into practice the principles of inclusive development. Ladies and gentlemen, I want to say in conclusion that this annual conference of the Boao Forum for Asia is taking place at a very high level in terms of its delegates, and this reflects its growing influence. Russia wants to continue taking productive part in its work. Our dialogue should continue, and indeed, the discussions begun today here in Boao can continue in June at the St Petersburg Economic Forum. I invite all of you to come and take part.